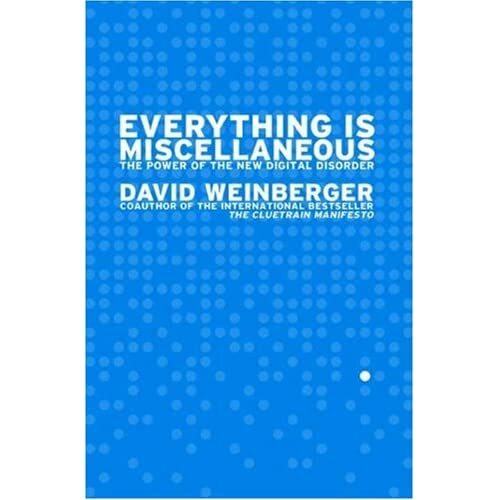 One of the central ironies of David Weinberger’s new book, “Everything is Miscellaneous”, is that a book about classification is bound to suffer from classification problems. Reviewers and bookstore owners are inclined to think of David as a business writer because his previous books – The Cluetrain Manifesto and Small Pieces Loosely Joined – were profoundly useful in helping businesspeople understand what this World Wide Web thing was really all about. But it’s a mistake to consider David’s new book solely as a business book. Which isn’t to say that reading Everything is Miscellaneous won’t help you make a buck in world of Web 2.0. It probably will, as the issues David explores are core to any business that deals with information and knowledge… which is to say, virtually every industry you can think of. But “Everything is Miscellaneous” is also a philosophy book. It’s about the shape of knowledge, and how moving information from paper to the web changes how we organize and how we think. And this means that David’s book crosses from territory like Wikipedia and Flickr into Aristotle and Wittgenstein. This would be a dangerous path for a lesser author to take, but David grounds his explorations in examples and interviews that are, as Cory Doctorow puts it, wonderfully miscellaneous. We bounce between the lives and ideas of taxonomers past – Linneaus, S.R. Ranganathan, and the wonderfully strange Melvil Dewi – and the librarians and software developers who are making sense of today’s digital disorder. Adding a layer of metadata to the physical world helps somewhat – card catalogs allow us to put multiple pointers to a single physical location so we can file a single book on Military Music under both “Music” and “Military”. But card catalogs pale in comparison to the wonders of “third-order” metadata, the sorts of organization we’re capable of in a digital age. A book listed by Amazon can be filed in any number of categories. It can be annotated with reader reviews, added to reading lists, enhanced with tags or statistically improbable phrases. The “card” in the card catalog can be larger than the book itself, and the full text of the book serves as metadata, as the book itself is searchable. David argues that the fact that we tend to organize data in terms of its physical placement has consequences for how knowledge works. We tend to think in Aristotelian terms – objects are members of a categories, and share the same traits as other members of that category. We can organize these categories into trees: a robin is a bird, which is an animal. We can expect the leaves of trees to share the attributes of their branches, and we expect each leaf to fit onto only one, specific branch. But that’s not knowledge works in a digital age. When I bookmark a webpage through del.icio.us, it’s to my benefit to add many tags to it, both because it makes it easier for me to find it again, and because it helps other people find it as well. Weinberger advises us to “put each leaf on as many branches as possible”, building a tree that looks more like a hyperlinked pile of leaves. This suggestion, along with advice to use everything as a label, to filter only when we need outputs, and to give up the idea that there’s a “right way” to order things, serve as a roadmap for how to build tools and services in a digital age. But the magic of David’s book is that this practical advice is also an invitation to explore categorization, language and knowledge itself. If knowledge is a pile of leaves instead of a tree, how does the shape of our knowledge change? It’s questions like this that make “Everything is Miscellaneous” deceptively deep. One moment, we’re thinking about how we organize photographs in shoeboxes or on our hard drives, and a moment later we’re asking whether we understand “shoebox” in terms of definitions, family resemblances or exemplars. It’s a little like drinking a mojito – smooth going down, but deceptively powerful, and slightly staggering when you get up to buy the next round. I’ve read the book twice now, and am looking to my third pass through it. David’s done something rare and admirable here – he’s written about a world I thought I knew well in a way that makes me realize that there are innumerable depths and implications left to explore. Disclaimers: David is a friend, a colleague, someone I deeply admire, and someone I aspire to write and think like. There’s no doubt that these facts influence my judgement in writing about his book, but hey, there it is. This entry was posted in Berkman, Geekery, Media. Bookmark the permalink. Interesting – thx for sharing this! Wow, that’s a review! After reading your post, someone can do nothing but to buy the book and read it. I wonder if you know why David didn’t release this book under a Creative Commons license. [There is a small typo in your post, I think.